After doing many, many cruises over the past few years, one fact stands out loud and clear. We have never had a cruise that we didn't enjoy from start to end. We have definitely found our favourite way to travel. 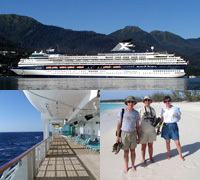 We have done so much on each cruise that I have put together a "cruise diary" for each trip. Otherwise the ports would all run together in our memory or we would forget things we have enjoyed so much. As such, these writings are not so much a review of the ship or the cruise, but rather a day-by-day report of what we saw and did. To view a diary, locate the cruise in the list below and click on the corresponding ship icon in the "View" column. Enjoy!